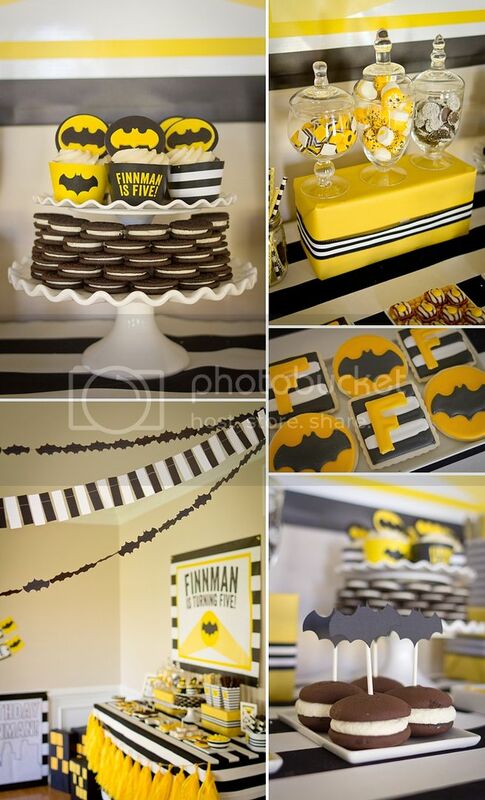 Holy Birthday, Batman! 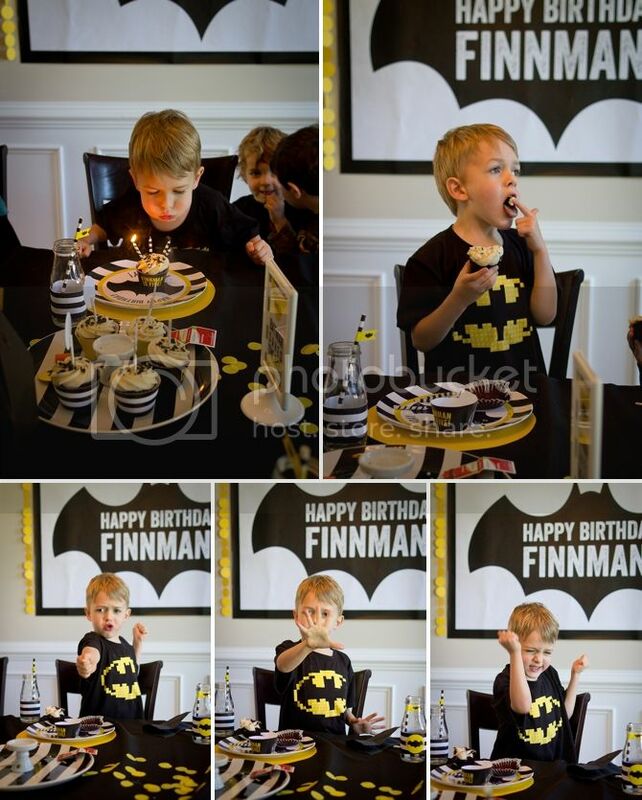 Five year old Finley loves a lot of things--and one of his very favorite things is BATMAN. 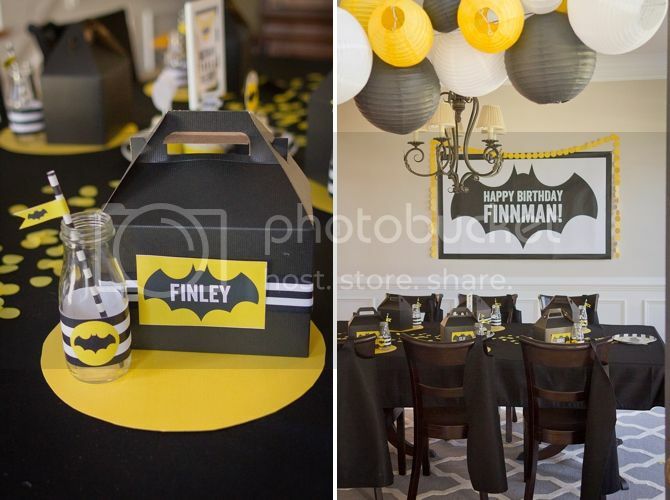 We were planning on having a rocket ship party and he was ok with it--but as soon as he realized he could have a Batman party there was no turning back... and after settling on a look for Braden's party, I realized I could make Finley's party practically the same--saving me a ton on decorations and treats. We didn't do a great job of getting pictures of us with the birthday boy--my fave photographer Jenn was absent and there were many five year old boys running around. Just a liiiittle bit of chaos! I love the way the party came together! This is a small amount of the details and pictures--if you want to see more, head over to the RV blog! I wrapped random boxes on black plastic tablecloths to make a skyline. A cheap project that I absolutely loved! 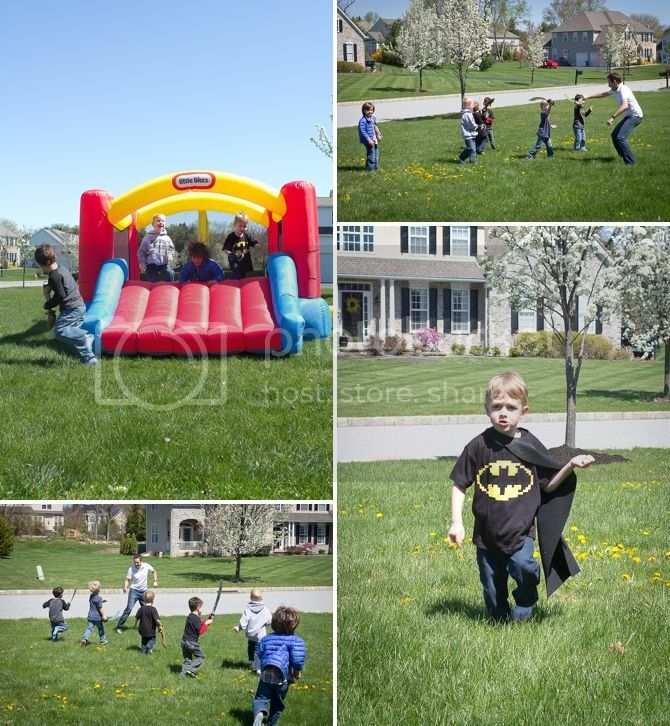 If you click back to Braden's party you will definitely see the obvious similarities. I tried to differentiate them in a few ways, but I just loved the table cloth in tassels too much to take them down. 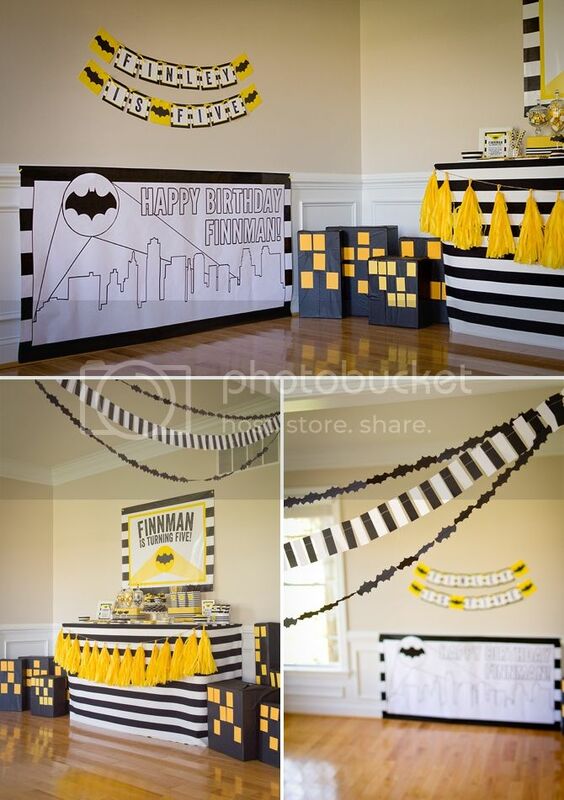 I opted for a vinyl backdrop this time because I felt like it really needed the yellow spotlight! To save time and money, I made double batches or reused treats from Braden's party. It's only a little extra effort to make a double batch of dipped marshmallows/pretzels. We saved a lot of the decorative candy in ziploc bags to put back out. Victoria made ADORABLE sugar cookies again--this is my third year to convince her to make them for me! The cupcakes and whoopie pies were from Trader Joes and looked too cute. 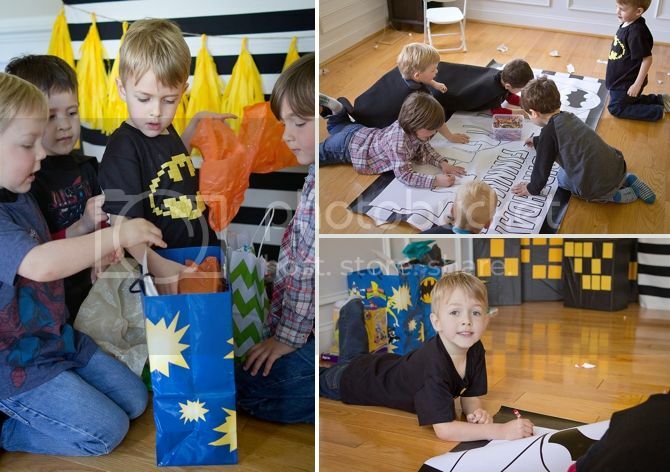 I made each of the boys little capes that hung on the back of their chairs--they seemed to enjoy running around in them! This was a bit of a different party--the parents dropped off the boys and they had a LOT of energy. Sol entertained them by telling jokes at lunch. Surprisingly, only about half of them ate the pizza I was sure they'd love! How cute are those little crimefighters?? We invited all the boys from his preschool class and only one couldn't make it. 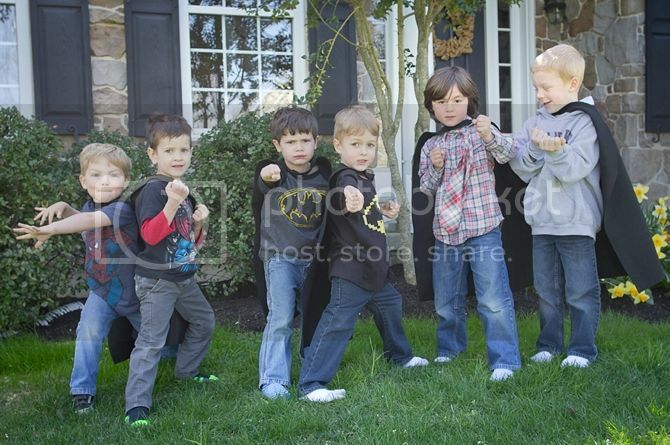 They really were pretty adorable--and most of them came in a superhero shirt! It was a lovely day, so we spent a lot of time running around in the front yard. One of the boys went in to the bathroom and came back with a bunch of swords from the Peter Pan party last year--so they sword fought. And chased Sol. A lot. There was some crying and arguing over who got which sword, but I think it was mostly fun. The cupcakes were a hit--and it was so fun to have all Finley's friends sing to him. It felt much more like a real big kid party than his other ones have! This was the first time we've opened presents at a party and it was preeeetty adorable. The boys were all so excited, they were practically sitting on top of each other. Finley got a lot of Legos and Batman stuff--his friends know him well! They also enjoyed coloring on the coloring wall. They drew a lot of cute superheroes! We had so much fun celebrating with our little guy. It brings us so much joy to see him growing into a cool little dude--enough joy that it covers the pangs of sadness of him not being my teeny baby anymore! the little boys in the capes are SO cute!